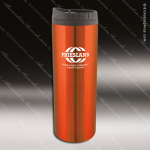 Premium 16 Oz Travel Tumbler With Stainless Steel Exterior And Plastic Inner Lining. Laserable Or Screen Printable. Comes in your choice of Blue, Black or Red.